Cornbread is one of those foods that we love but forget about. Every time we eat it, we think about how good it is and even comment that we should make it more often, but then time passes and we forget about it until we make it again several months later. This time though, I wasn’t making plain cornbread, I was making cornbread waffles. We have used cornbread for waffles before, making Jalapeño Cornbread Waffles Topped With Turkey Chili and Taco Cornbread Pie Waffles. This time, because I was making these waffles for Natalie and her friends, we once again used bacon and cheddar as primary ingredients — they’re two of her absolute most favorite foods. Because I wanted to eat the Bacon Cheddar Cornbread Waffles too, I replaced the milk with almond milk and used dairy-free sour cream, making the whole dish lactose-free. Hooray! 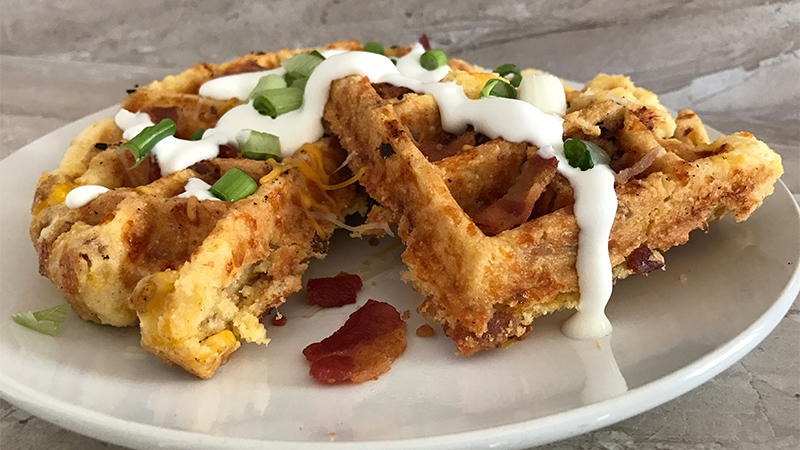 When planning the Bacon Cheddar Cornbread Waffles, I knew I wanted to use real, freshly cooked bacon, so I picked up a pack of thick cut bacon at the grocery store and quickly cooked the bacon in the oven and chopped it up into small-medium size pieces. I also picked up a box of Jiffy Cornbread Mix. I love it because it doesn’t make too much (about three waffles per box) and it’s cheap and delicious. Plus, it doesn’t really matter what brand of cornbread mix you begin with when you’re mixing in bacon, cheddar cheese, and sweet corn niblets. If you can make cornbread, you can make these yummy Bacon Cheddar Cornbread Waffles. First, preheat the waffle iron on medium heat and prepare the cornbread batter as directed on box, adding in sweet corn niblets, bacon, and cheddar cheese. Next pour the cornbread batter into waffle iron, being careful to not overfill it and close the waffle iron. Cook for approximately 3-4 minutes on medium heat. To serve, top the Bacon Cheddar Cornbread Waffles with more bacon and cheddar cheese. Drizzle with sour cream and sprinkle with green onions. But be careful. I’m warning you now, these waffles will go quickly. Be sure you set aside one for yourself or you might not get any! If you’re serving a big group, consider cutting the waffles into fourths and serving them in triangles. The secret to these cornbread waffles is the bacon, cheddar cheese, and corn baked inside. Preheat waffle iron on medium heat. Prepare cornbread batter as directed on box, adding the sweet corn niblets, 1/3 cup bacon, and 1/4 cup cheddar cheese. Do not to overmix. To serve, top Bacon Cheddar Cornbread Waffles with remaining bacon and cheddar cheese. Drizzle with sour cream and sprinkle with green onions. Serve immediately. If you have more bacon and cheddar and you want to add more to the corn bread batter, go for it. I have and it's only makes it even yummier!